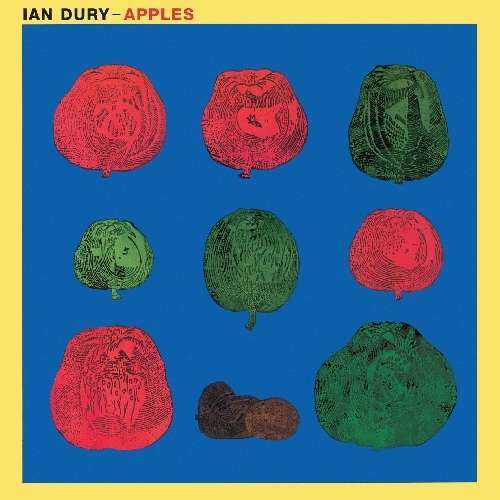 Der Artikel Ian Dury: Apples wurde in den Warenkorb gelegt. Adorned with a painting by Peter Blake, ‘Apples’ is the sole album recorded by Ian Dury for WEA Records, originally released in 1989. It accompanied his stage show of the same name, performed at London’s Royal Court Theatre that year. The songs were co-written with Mickey Gallagher of the Blockheads, although ’Apples’ and ‘England’s Glory’ actually date back to Dury’s Kilburn and The High Roads days. The album was recorded before the show opened and includes twelve of the twenty songs that featured in the show. The players include Paul Weller’s drummer Steve White, Blockhead Davey Payne on sax and Wreckless Eric and famed musical actress Frances Ruffelle (mother of singer Eliza Doolittle) on vocals. The booket is illustrated with ephemera and a note by Alan Robinson.